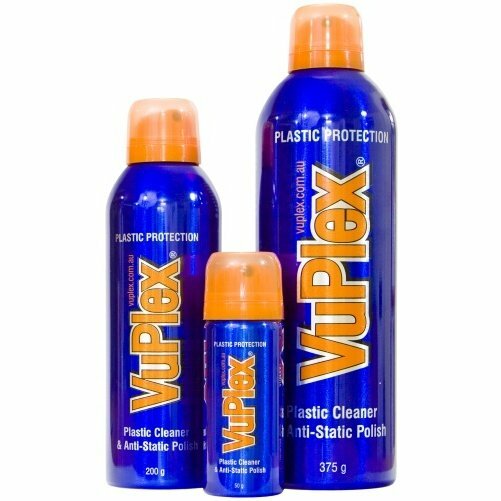 VuPlex: A Perfectly Clear and Safe Maintenance Solution for Plastics. VuPlex® is a preventative as much as a cure. If VuPlex® is applied when plastic is new, it protects the surface from premature aging. If the surface is already damaged with fine scratches and in-ground grime, VuPlex® will restore the surface and clarity, leaving a finish that is polished and protected. Available in store and land freight only, call for orders. It cleans using safe ingredients that won’t damage plastic surfaces. It applies a fine coating of wax that gives the surface protection from micro scratching. The wax acts as a barrier against water (hydrophobic) and other atmospheric conditions that cause aging and a break down of clarity. Static that is built up in the plastic surface and attracts other abrasive material such as dust, is controlled by VuPlex’s® anti-static properties. VuPlex® polishes to a high shine and restores the lustre and “new look” to the surface. The finish is not sticky or greasy and can be achieved in mere seconds.